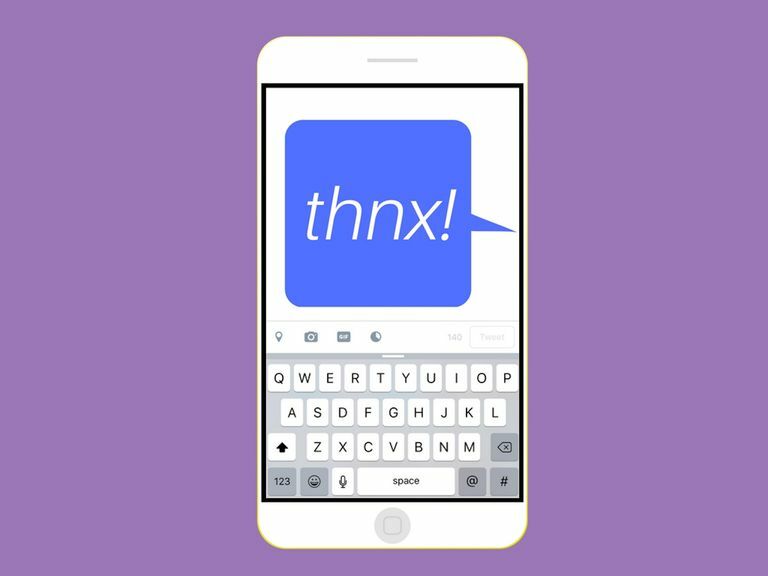 What Does THNX Mean in Text-Speak? Whether you're interacting with strangers on social media or text messaging a close friend, you're almost bound to come across the acronym THNX at some point. Here's what you need to know about it. It's really just that simple. The letter A is taken out and letters KS are replaced with an X so that the word is still easy to interpret very quickly. Friend #1: "Hey can you bring an extra stick of butter to the dinner party tonight? Just realized I'm all out..."
The first example above shows Friend #1 simply thanking Friend #2 for agreeing to help them out with a request. Friend #1: "Thnx for the bday card! Just got it today in the mail, it was awesome!" Friend #2: "Yw! Glad you liked it!" The second example above shows how the abbreviation THNX can be used in a sentence to thank someone for what they did. In this case, Friend #2 responds with the acronym YW, which stands for You're Welcome. THX: This is an even shorter abbreviation of the word thanks. Similar to THNX, the letter N is left out to make it even simpler and faster to type. TY: TY is an acronym for Thank You. Some people might use this acronym when they'd rather say thank you instead of thanks. KTHX: This is an abbreviation for the phrase "Okay, thanks." It's a quick and easy way to confirm something and politely thank the other person in the process. KTHXBYE: KTHXBYE means "Okay, thanks. Goodbye." Like KTHX, it's a way to confirm something and thank the other person. The only difference is that the word BYE is tacked onto the end to communicate that the conversation is over. KTHXBAI: This variation has the exact same meaning as KTHXBYE, however, BAI is used instead of the word BYE. BAI is an internet slang word for BYE, which also means Goodbye and is also used in this variation to mark the end of the conversation. So now that you know what this abbreviation means (plus all of its many other variations), you should also know when it is and isn't appropriate to use. Here are a few guidelines to use if you're considering using it. You're having a friendly, casual conversation. The speed of your reply matters more than spelling and grammar. You know the other person/people well enough that you don't need to maintain a high reputation or impress them substantially. Your conversation has more of a serious undertone than a casual one. The speed of your reply doesn't matter. For example, a carefully crafted email message might be better suited for saying thanks than a real-time conversation held on Facebook Messenger. You need to thank someone who you deeply respect and want to impress (such as an employer, a professor, a potential love interest, etc). 'FWM'? What Does That Even Mean In Text Speak? What in the World Does LMK Mean in a Text? What in the World Does ILY Mean? When Someone Wants My ASL, What Do They Mean? What Does It Mean When Someone Texts OFC? What in the World Does TMW Mean? What in the World Does IMY Mean? What in the World Does WFH Mean?